(JACKSON, Miss.) 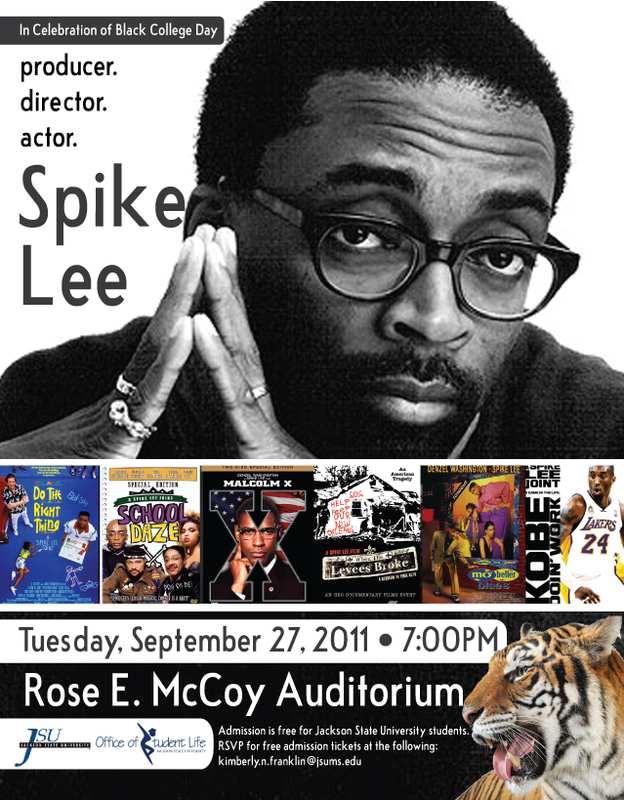 – Producer, director and actor Spike Lee will appear at 7 p.m. Tuesday, Sept. 27, at Jackson State University’s Lee E. Williams Athletics and Assembly Center in celebration of Black College Day. The event is free, but reservations are required for admission. To reserve a ticket, send an e-mail to: kimberly.n.franklin@jsums.edu. Lee is a notable writer, director, producer, actor, and author who revolutionized both the landscape of independent cinema and the role of black talent in film. Widely regarded as a premiere African-American filmmaker, Lee is a forerunner in the ‘do it yourself’ school of filmmaking. Lee’s latest endeavor is the follow-up documentary If God is Willing and Da Creek Don’t Rise, which revisits the recently storm-ravaged GulfCoast region as residents attempt to rebuild in their cities while also demanding assistance and accountability from their political leaders. This film comes on the heels of When the Levees Broke: A Requiem in Four Acts, the groundbreaking first documentary that followed the plight of Americans stranded in New Orleans after Hurricane Katrina. 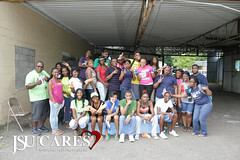 For more information about Lee’s work, visit http://www.40acres.com. (JACKSON, Miss.) — In its newly released study, Washington Monthly magazine ranked Jackson State University one of the top 10 institutions of higher learning across the country in terms of social mobility, research and service ratings. Coming in at No. 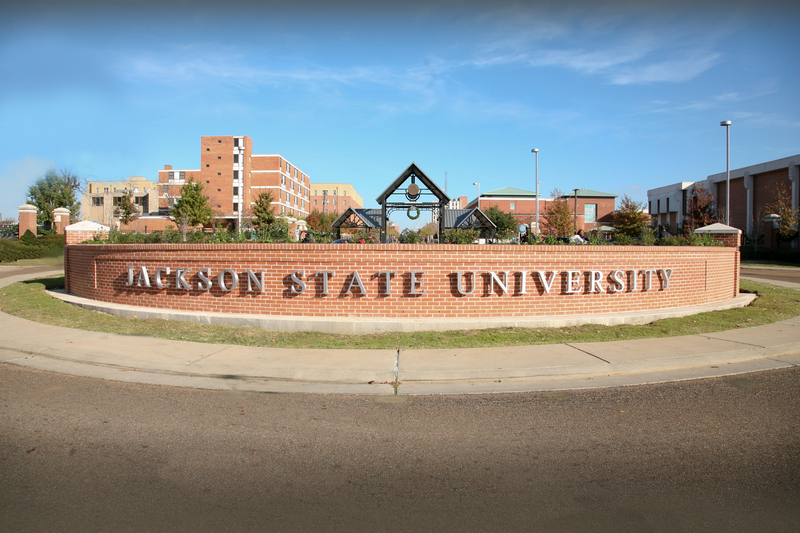 9 among 258 institutions, Jackson State outranked Princeton (No. 31), Yale (No. 39), the Georgia Institute of Technology (No. 54) and Howard (No. 73) universities. Jackson State is the only Historically Black College or University to break into Washington Monthly’s top 10. This year’s ranking is up significantly from last year, when JSU appeared No. 45 on the list. The research rating measures the rate at which students go on to receive Ph.D.s., the number of doctoral degrees awarded by the university and the amount of federal research dollars garnered. Last year Jackson State raised over $57 million research dollars. The service rating also is a reflection of the number of students serving in U.S. Army and Navy Reserve Officer Training Corps programs, the percentage of alumni in the Peace Corps, the percentage of students receiving Pell grants and the percentage of federal work-study grant money spent on community service projects. (JACKSON, Miss.) 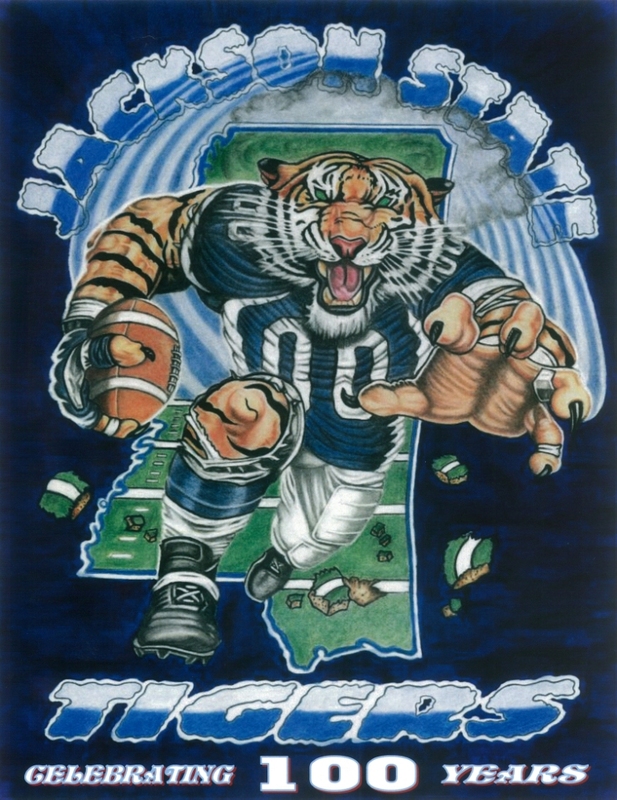 – Professional sports and humanitarian artist Willie F. Hobbs of Pittsburgh will sign prints of his “The Claw of the Tiger” posters commemorating 100 years of Jackson State football from 11 a.m. to 2 p.m. Friday, Sept. 2, outside of the Jackson State University Book Store. The posters cost $10. 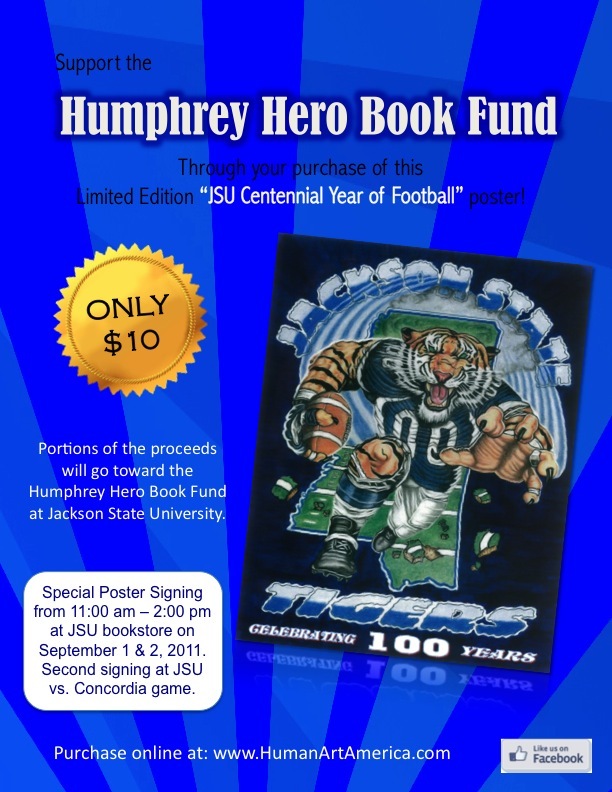 A portion of the proceeds will go to the “Humphrey Hero Book Fund” established by Jacqueline Humphrey, executive director of administrative services for JSU’s Office of Academic Affairs. Humphrey and Hobbs are both natives of Winona, Miss. 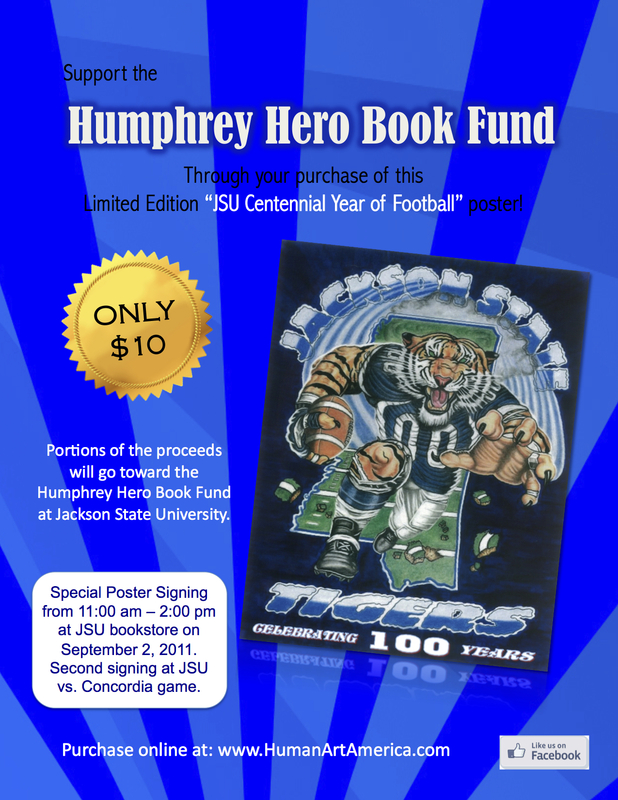 The book fund is intended for JSU students who need help paying for books. For information about applying for the scholarship, visit: www.humanartamerica.com. 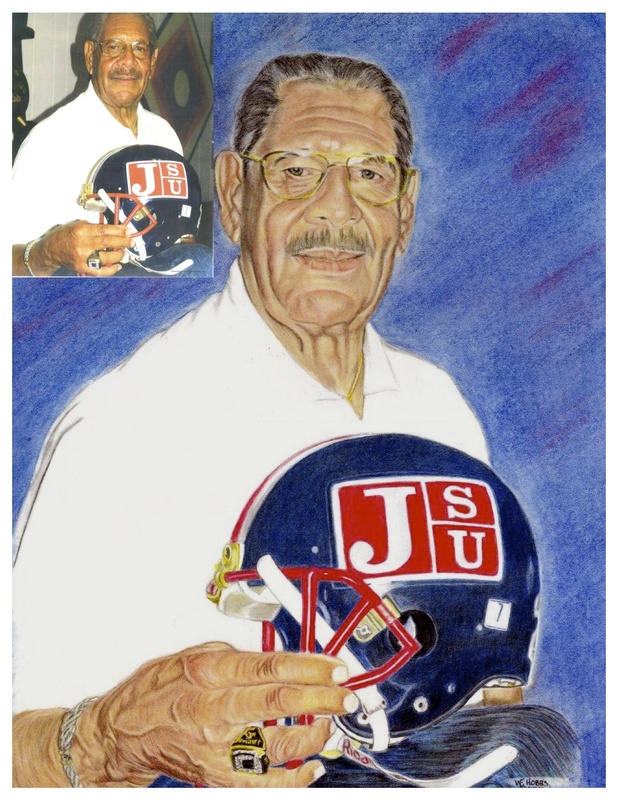 Hobbs will also appear with Coach W.C. Gorden at the Mississippi Veterans Memorial Stadium from 11 a.m. to 1 p.m. Saturday, Sept. 3, to sign and sell “The Claw of the Tiger” posters and 250 limited edition posters Hobbs created of JSU’s winningest coach. Gorden will sign copies of the poster featuring him. The cost for both posters is $50. Hobbs founded the organization, Humanitarian Artists of America, to raise money for charities and nonprofit groups through the sale and auction of original art and prints. His posters have raised funds for groups including the Flight 93 National Memorial Campaign, the Afro-American Music Institute of Pittsburgh, the American Cancer Society, the American Diabetes Association, Meals on Wheels, and for people affected by Hurricane Katrina. The Pennsylvania State Senate has honored Hobbs for his work. (JACKSON, Miss.) – The Washington Addition Prenatal & Early Childhood Education Project will celebrate families during a Family Fun Day to be held from 2 to 4:30 p.m. Saturday, Aug. 27, at T. B. Ellis Gym. 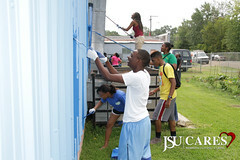 The facility is located on JSU’s campus at the corner of Walter Payton Drive and Dalton Street. Area families can enjoy storytelling, magic tricks, creative dance, arts and crafts, games, music and giveaways while also taking advantage of free educational and fitness activities. The event is sponsored by the Jackson State University Human Capital Development Division and the Robert Hearn Support Foundation. For more information, call 601-979-0663.
published the book, Promoting Creativity in Childhood: A practical guide for counselors, educators and parents. “This book explains the dynamics of human development in respect to creativity and giftedness from cognitive, physical, and personality domains,” said Yazdani, assistant professor in the College of Education and Human Development. 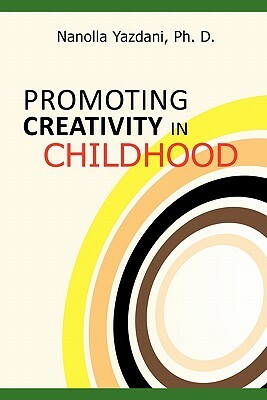 Designed specifically as a textbook for undergraduate courses in gifted education, early childhood education, counseling, and developmental psychology, the book offers a broad overview of foundational principles and practical approaches for developing the creative potential of children at school and home. Yazdani holds a Ph.D. in educational psychology from Mississippi State University. The 182-page book was published by AuthorHouse Publishing Company in May 2011. It is available at Amazon.com and other retailers. hearing on gender inequities in intercollegiate athletics, she specifically addressed the lack of women in athletic administration. “Women should not be limited to traditional positions in such as assistant or associate director of athletics. … In particular, when director of athletics positions become vacant, institutions should consider hiring a woman for the job,” she said in her prepared statement. Fuller’s words have proved prophetic. At the time, she was in one of those “traditional” roles as associate director of Intercollegiate Athletics at Indiana University of Pennsylvania. But she went on to crack glass ceilings at several schools. She was athletics director at Maryland-Eastern Shore, Tennessee State and Northeastern Illinois universities. 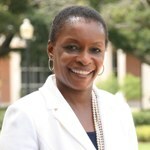 Thompson is President of the Student Government Association. 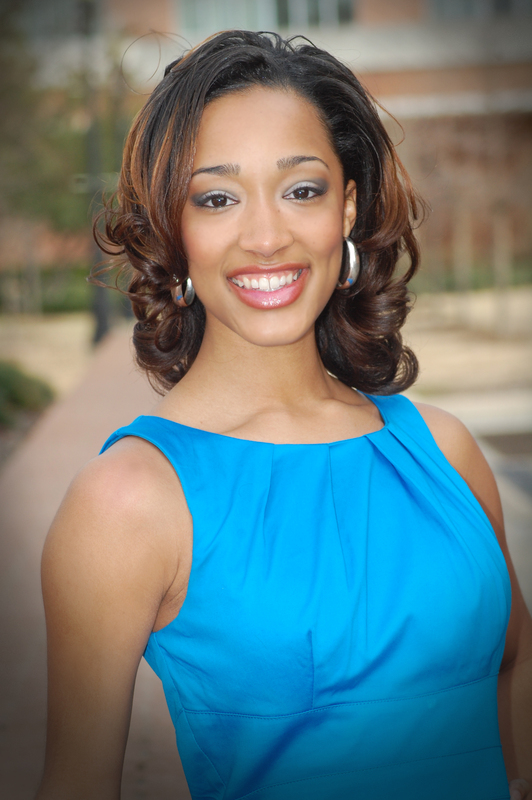 Ashley is a 2008 graduate of Murrah High School and was a dance emphasis student at Power Academic and Performing Arts Complex. She is a senior at JSU majoring in Mass Communications with a concentration in Multimedia Journalism. Before capturing the crown, Ashley was a Prancing J-Sette from 2008-2011. Ashley is an active member of Delta Sigma Theta Sorority, Incorporated, Alpha Lambda Delta Honor Society, and Sigma Alpha Pi Leadership and Success Society. At Murrah, Ashley was selected as Homecoming Queen and was a Top Ten Scholar. Thompson graduated from Callaway High School in 2008. He is a JSU senior majoring in Accounting and Finance. 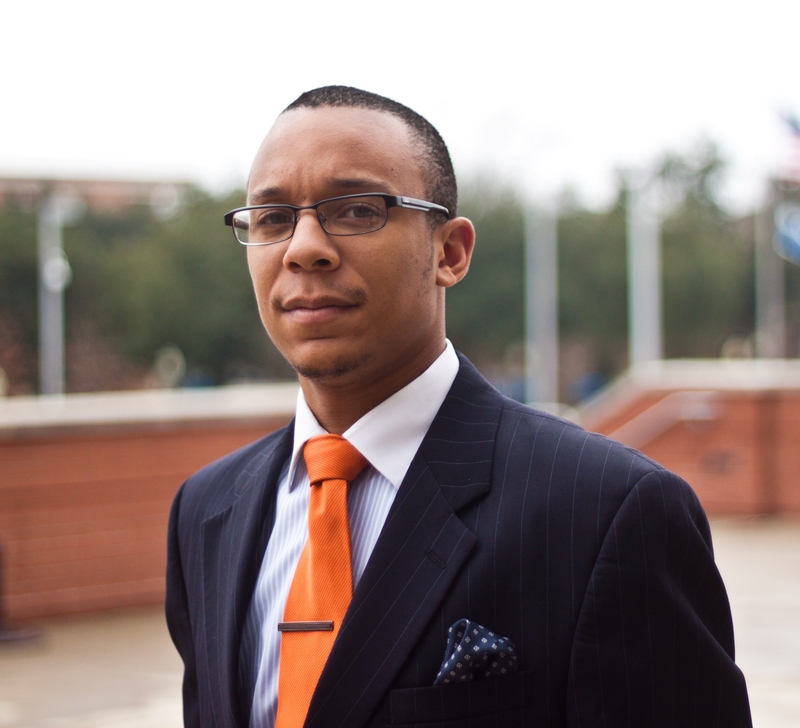 In previous years, Thompson has served on SGA as a Justice, Business Manager, and as Mr. Freshman. He was a freshman residential assistant and is an active member of Alpha Phi Alpha Fraternity, Incorporated. 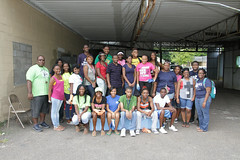 Thompson was also active in student government and community service as a student at Callaway.